The privacy and relaxed atmosphere of Blue Mountain Beach is ideal for people who yearn for a calming presence in a community. Early sailors who spotted the blue lupines covering the sand dunes reportedly gave the area its colorful name. Erin Oden and Coastal Luxury specialize in the listing and sales of Blue Mountain Beach real estate. The original neighborhood of Blue Mountain Beach is governed by a voluntary association with optional fees. Blue Mountain Beach is situated along Scenic Highway 30A at the highest recorded elevation on the Gulf of Mexico, and is approximately 19 miles west of Panama City Beach in Northwest Florida and on 13 miles east of Destin. 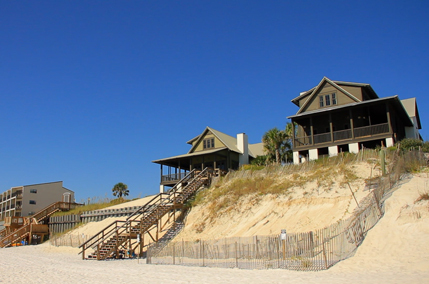 Blue Mountain Beach is made up mostly of traditional Florida cottage-style homes situated along Blue Mountain Road and the beachfront. The area also includes 2 of the most popular condominium projects on the beaches of 30A, including the Mediterranean influenced Adagio and Bella Vita. Draper Lake and Redfish Lake are located in the Blue Mountain Beach area, and are among only 11 coastal dune lakes along the beaches of South Walton. These rare bodies of water are found only in Northwest Florida and remote parts of Africa and Australia. Redfish Village is a condominium project located at the intersection of Scenic Highway 30A and County Highway 38 in Blue Mountain Beach. The development includes a modest shopping center with a bank and boutiques.